Few in the world retain such a vivid and amazing career as Dave Grohl. Born in 1969, the American rock musician, singer, songwriter, multi-instrumentalist is the primary songwriter for Foo Fighters and plays the drum for Them Crooked Vultures. 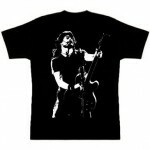 Dave Grohl has also been a part of successful bands Nirvana and Scream as their drummer. Dave Grohl started his side project which was short-lived title ‘Late!’ and ‘Probot’. Dave was also involved with Queens of the Stone Age for a while. Dave Grohl got his first break with the aid of Scream. The band auditioned for the post of drummer after their drummer Kent Stax departed. Dave was only 17 though he lied about his age and auditioned for Scream. The band selected him and ever since Dave has been unstoppable. His discography boasts of around 15 studio albums, 6 live albums, 8 compilation albums, 64 singles, 6 EPs, 11 videos, 4 soundtracks and 26 collaborations. Dave Grohl is the real living inspiration for any aspiring musician.